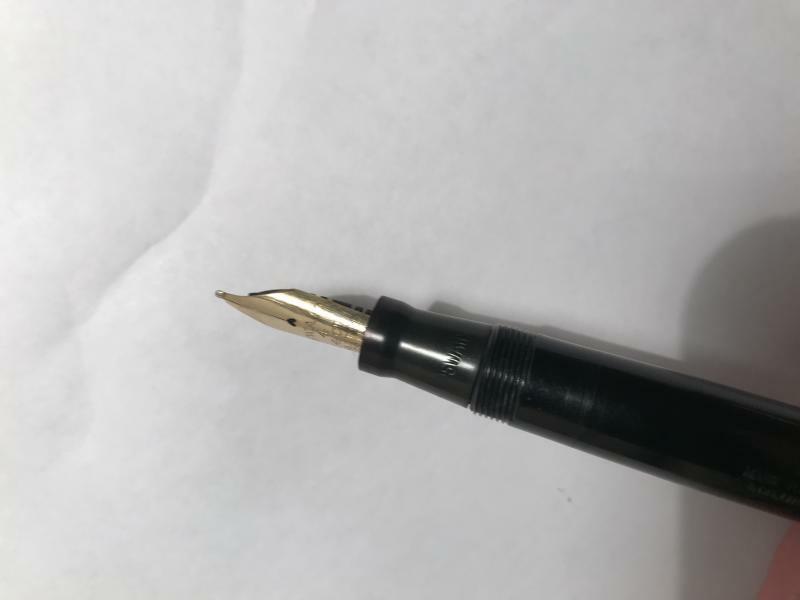 Is This Swan Nib Damaged? Nothing wrong with that nib at all. Some were made like that. I can't tell you much about it. I think Cob had info in a post a while back. Assuming it came with a section and feed, it is a lovely pen! Why 1060 and not L4XX/60? It matches the lizard leverless, except the banding, and those have the older designation. Or perhaps the banding is the answer, showing it to be later 1060 numbering?? Yes it could be a L445/60, but in that case it would almost certainly have carried a model number and since the original poster asked which model it is I assume it hasn't. The change from L212.60. L445/60 and L645 /60 to 0160/1060/2060 I think came in 1939/40, why I don't know. 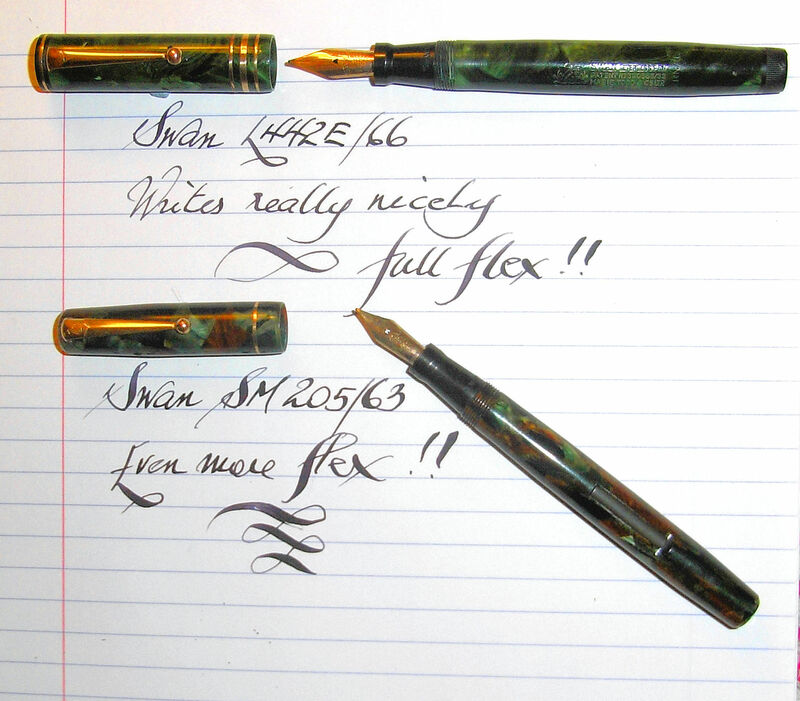 I have a L645/60 (albeit with Onoto 4 nib in place of the Swan 6) it is identical to a 2060! However after the factory was destroyed by bombing in 1940 I suspect that unnumbered pens may have been produced in the replacement factory. 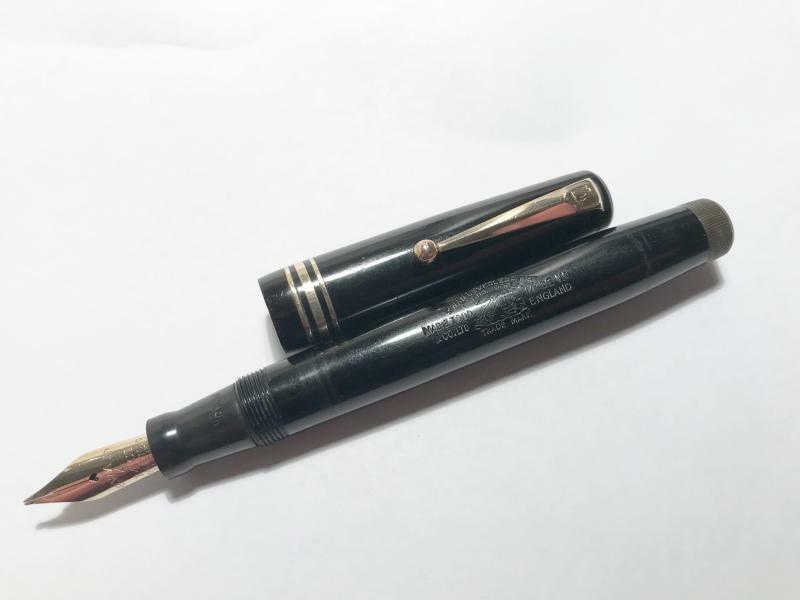 Pens were of course produced during the war, but manufacturers were restricted partly by shortages of materials and also by Government regulation which limited the number of models each maker could produce. Thanks Cob! Great answer. I do have to admit that the banding pattern is not one I have seen on the L4XX numbering, so the later 4 digit is much more likely to be correct. I have a TERRIBLE habit here of keeping my brain stuck on pre-war MT pens, since I arbitrarily collect MT pens only up to that time. It is totally a wrong way to think, but here is my admission for all to see. I can't promise to correct my annoying habit. And based on this, I tend to lump together the US and English pens, which I know drives Marc a bit batty. But there is so much overlap pre 1940! Well, there is my FPN confession! Hi Greenie, would a couple more photos help? Barrel imprint, section with Swan, cap with Swan near the top and swan on the base of the feed, nothing else, hope these help, thank you. I have such nibs and I wouldn't say these didn't leave the factory like that. In fact I have an Osmia Faber Castel currently inked with the same shape nib. Kind of spoon tip. 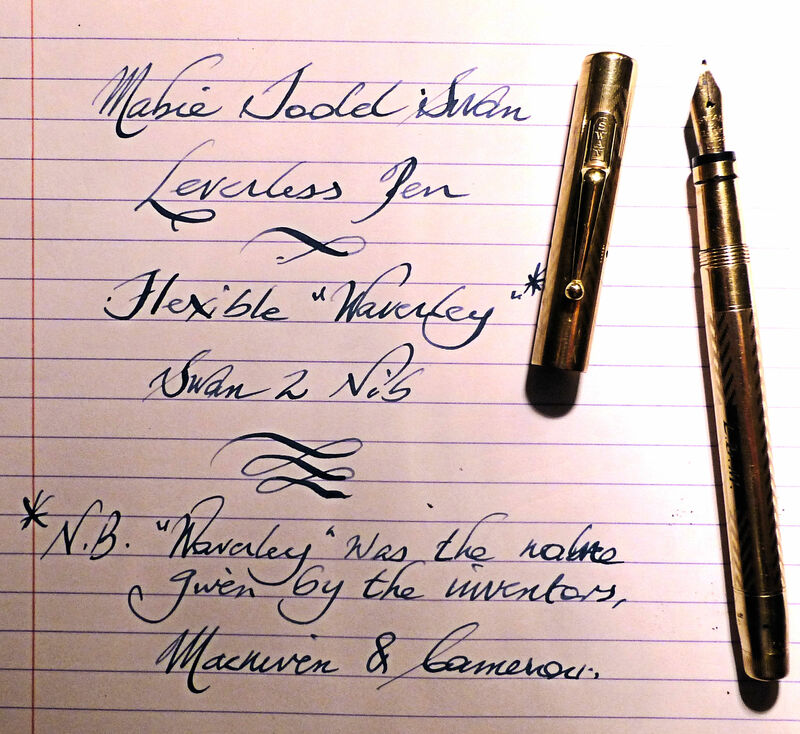 And the nib is full flex. Not a clue. Have you tried asking in the Mabie Todd forum? The topic with the same pictures was posted in two different forums. I've merged them into one in the forum that has had the most views and responses. It is frustrating that so often Mabie Todd did not stamp model numbers on the pens. 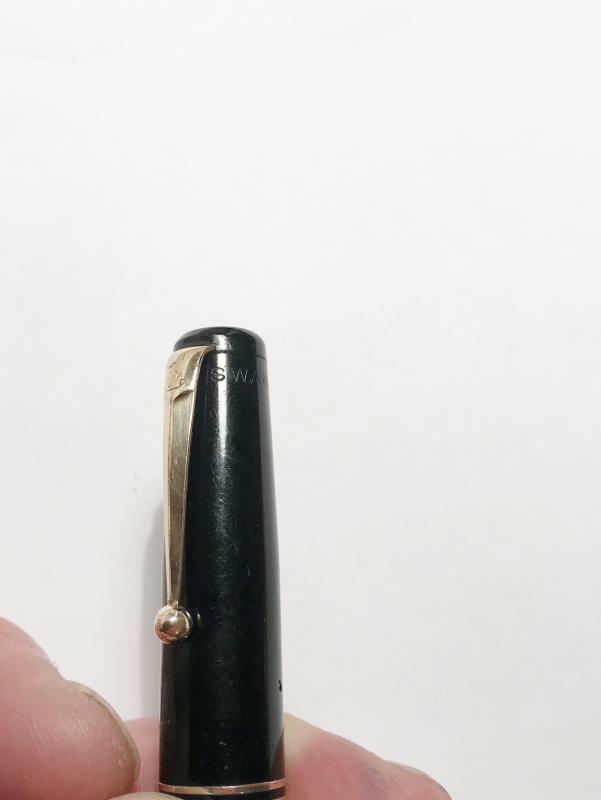 Your pen certainly dates from the late 1930s., the clip mounting tells me that The band pattern was used on the big L645/60 (No 6 nib) so yours might be a L445/60 after all or another possibility might be L412/60. I have a L312/60 but this has a No 3 nib and worse no cap! 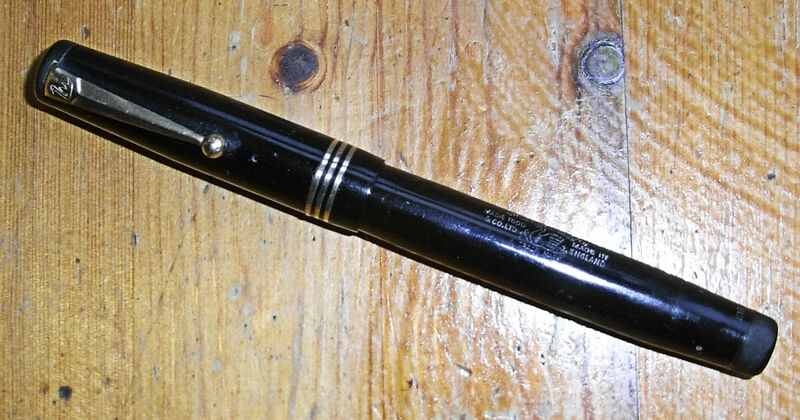 Earlier Leverless pens (like my 442) had the model number stamped on the end of the twist knob; your pen is probably too late for this. Quite apart from their elegance and quality, Swan pens provide plenty of discussion opportunities! Edited by Cob, 16 January 2018 - 03:08. I might have mentioned this before - but the ruckus over consistency in model numbers baffles me some. These numbers were used to control Mabie Todd's inventory, they weren't model numbers like the Apple Iphone 8. That they weren't consistent over the years wasn't really important to them, and why should it be? Perhaps frustrating is that they didn't have model names - Parker Duofold jr. for example. Customers didn't stand around the watercooler saying "I just picked up a SM 205/63"
well, I guess that's what collecting is all about. There is something esoteric for each of us to focus on! That IS a big part of the fun. But the 1920s Swan advertisements showing the various shapes and colours available did include model numbers didn't they? I could imagine a customer entering a shop with an advertisement and pointing e.g. to a 242/52 and saying "have you one of these in stock for me to try?" Like Greenie, I find the model numbers of Mabie Todds an endless source of fascination; rather nerdy I'm afraid. And Parker cannot boast: there are loads of Parkers with no information on them. Conway Stewart's (non) system was completely illogical - to the point of being barking mad. Waterman's did try from time to time, although saying that I have here what I believe to be a 100-year pen. Does it say "100 year" on it? no it doesn't! And I have just acquired an auction lot including some Sheaffers. One lovely pen (with no tips to its nib) a very pretty lever filler has a white dot on its cap and apart from "W A Sheaffer Fort Madison &c" no indication what model it is. Edited by Cob, 16 January 2018 - 17:21.